Around the Christmas season, exchanging Christmas cards is one of the many ways that we connect to the people we haven’t spoken to in a while, or the businesses that have provided services to us during the rest of the year. In fact, the Christmas card industry is a multi-million dollar one, almost as lucrative as Valentine’s Day for businesses like Hallmark. Exchanging Christmas cards first began in Victorian England in the 1840s, and was in some ways an offshoot of the postcard craze that swept the English middle class at around the same time. According to Tony Allen, author of the website worldwar1postcards.com, the first card was produced by the artist John Horsley and commercially reproduced for the Christmas of 1840. From there, Christmas cards and the business of making them took off like wildfire, with families across England sending cards to their acquaintances and businesses making use of cards as an alternate form of advertising their services. 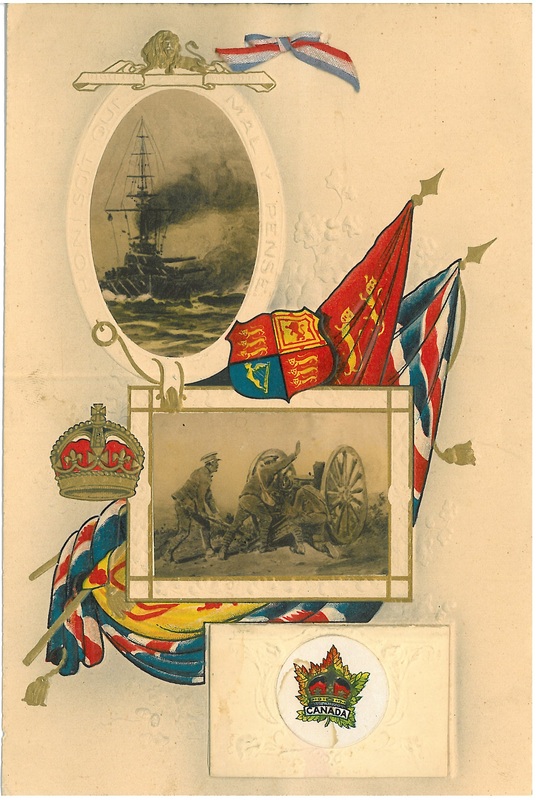 Soon afterwards, English regiments joined in on the tradition and officers could purchase professionally printed cards to send their good wishes to family and friends. Though it is extremely difficult to find evidence that the Canadian militia followed suit, certainly by the outbreak of World War I battalions of the CEF also had their own regimental Christmas cards to send as well. Some of these cards were quite elaborate, as you can see from the photograph at the beginning of this post, while others were much more simple affairs. Most of the cards in our collection appear to have been printed by the British printing firm Gale & Polden, who were responsible for many of the regimental histories published after the war. These cards functioned in some way as a reminder that there was life outside of the trenches and outside of the war; like many of the activities that took place around Christmas during the war years, such as Princess Mary’s gift box campaign and the advertising push to buy gifts for soldiers on the front, Christmas cards attempted to place a veneer of civilization on the war. They seem to say that despite the indignities of war, our way of marking the year and our holidays remain, even if they are celebrated far from home and in far from ideal conditions. Like the Second World War, Christmas on the front did not put a halt to fighting, even with the spontaneous truces that arose along the western front in 1914 and 1915; shelling continued and in some cases was heightened on Christmas Day to demoralise the enemy. However, soldiers made the effort to mark the holiday in some small ways and men would scrounge together Christmas feasts for themselves from their parcels or plan a special meal in the case of the officers. The war may have affected how people celebrated Christmas, but it did not prevent them from celebrating, a small victory in what must have been a very dark and confusing time.